I am so over teething. Calvin only has 2 teeth so far, so while I think my complaining may be a weeeee bit premature, I feel that I have no other choice. It’s either complain or explode. I choose complain. Right now his top 2 teeth are THISCLOSE to erupting. They look extremely swollen and painful and I hate it for him. I do. But if we don’t start getting some sleep around here we are all going to go crazy. Teething toys are fun and all but let’s face it, they are useless. Naps are shorter. Waketimes are crankier and we can all but count on almost constant waking between the hours of 4 and 7am. Have you ever tried to sleep with a toothache? Not gonna happen. That baby isn’t going to sleep. I would just like to take this opportunity to link virtual arms in solidarity with all the other mamas of young and possibly teething babies. THIS is one of those things that makes us so tired. So irritable. So …so…tired! 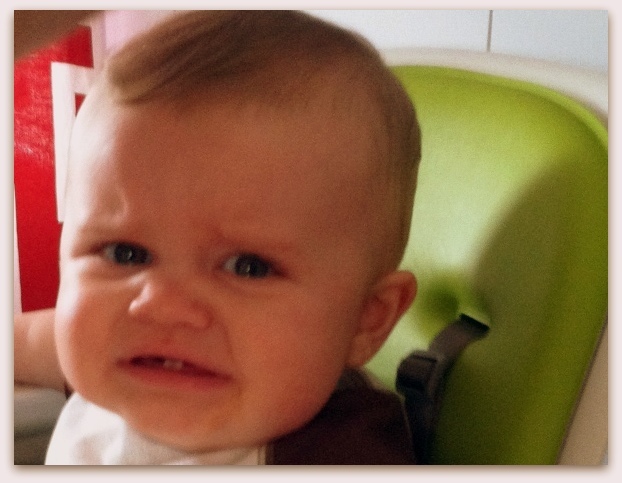 You are not alone moms of teething babies. Moms of non-sleeping chattering babies who DON’T sleep! Moms of non-sleeping chattering babies who look cute on the outside but mean to steal every bit of sanity you are clinging to for dear life. You are not alone. We can go crazy together. Poor thing. I so don’t miss the teething days.